Today, we added a new campaign management feature to Amazon Pinpoint: event-based campaigns. 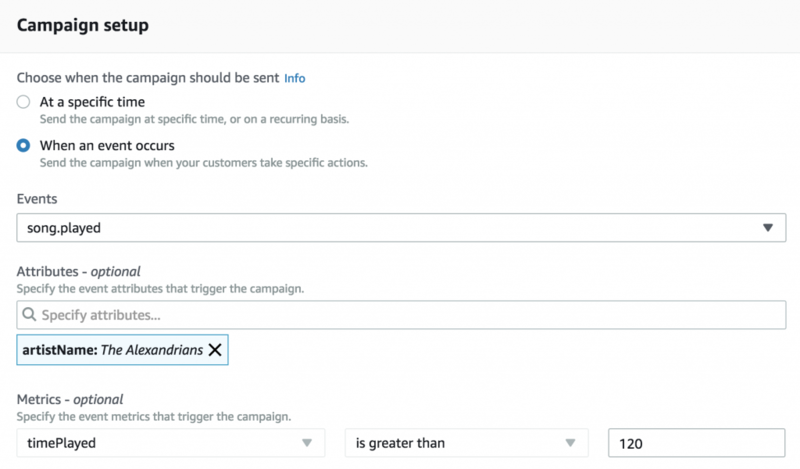 You can now use Amazon Pinpoint to set up campaigns that send messages (such as text messages, push notifications, and emails) to your customers when they take specific actions. For example, you can set up a campaign to send a message when a customer creates a new account, or when they spend a certain dollar amount in your app, or when they add an item to their cart but don’t purchase it. Event-based campaigns help you send messages that are timely, personalized, and relevant to your customers, which ultimately increases their trust in your brand and gives them a reason to return. You can create event-based campaigns by using the Amazon Pinpoint console, or by using the Amazon Pinpoint API. Event-based campaigns are an effective way to implement both transactional and targeted campaign use cases. For transactional workloads, imagine that you want to send an email to customers immediately after they choose the Password reset button in your app. You can create an event-based campaign that addresses this use case in as few as four clicks. For targeted campaign workloads, event-based campaigns are a great way to introduce cross-sale opportunities for complementary items. For example, if a customer adds a phone to their shopping cart, you can send an in-app push notification that offers them a special price on a case that fits the device that they’re purchasing. When you use the campaign wizard in the Amazon Pinpoint console, you now have the option to create event-based campaigns. Rather than define a time to send your message to customers, you select specific events, attributes, and metric values. As you go through the event scheduling component of the wizard, you define the event that you want Amazon Pinpoint to look for, as shown in the following image. In order to use this feature, you have to set up your mobile and web apps to send event data to Amazon Pinpoint. To learn more about sending event data to Amazon Pinpoint, see Reporting Events in Your Application in the Amazon Pinpoint Developer Guide. Let’s look at a scenario that explores how you can use event-based campaigns. Say you have a music streaming service such as Amazon Music. You’ve secured a deal for a popular artist to record a set of live tracks that will only be available on your service, and you want to let people who’ve previously listened to that artist know about this exciting exclusive. To create an event-based campaign, you complete the usual steps involved in creating a campaign in Amazon Pinpoint (you can learn more about these steps in the Campaigns section of the Amazon Pinpoint User Guide). When you arrive at step 4 of the campaign creation wizard, it asks you when the campaign should be sent. At this point, you have two options: you can send the campaign at a specific time, or you can send it when an event occurs. In this example, we choose When an event occurs. Next, you choose the event that causes the campaign to be sent. In our example, we’ll choose the event named song.played. If we stopped here and launched the campaign, Amazon Pinpoint would send our message to every customer who generated that event—in this case, every customer who played any song in our app, ever. That’s not what we want, but fortunately we can refine our criteria by choosing attributes and metrics. In the Attributes box, we’ll choose the artistName attribute, and then choose the attribute value that corresponds with the name of the band we want to promote, The Alexandrians. Now that we’ve finished setting up the event that will result in our campaign to be sent, we can finish creating the campaign as we normally would. There are no additional charges associated with creating event-based campaigns. You pay only for the number of endpoints that you target, the number of messages that you send, and the number of analytics events that you send to Amazon Pinpoint. To learn more about the costs associated with using Amazon Pinpoint, see our Pricing page. As an example, assume that your app has 50,000 monthly active users, and that you target each user once a day with a push notification. In this scenario, you’d pay around $55.50 per month to send messages to all 50,000 users. Note that this pricing is subject to change, and is not necessarily reflective of what your actual costs may be. You can only create an event-based campaign if the campaign uses a dynamic segment (as opposed to an imported segment). Because of this restriction, we recommend that you set up your segments so that they only include customers who use a version of your app that runs a compatible version of the SDK. Choose your events carefully. For example, if you send an event-based campaign every time a session.start event occurs, you might quickly overwhelm your users with messages. You can limit the number of messages that Amazon Pinpoint sends to a single endpoint in a 24-hour period. For more information, see General Settings in the Amazon Pinpoint User Guide. You can use these features today in every AWS Region where Amazon Pinpoint is available. We hope that these additions help you to better understand your customers and find exciting new ways to use Amazon Pinpoint to connect and engage with them.